She joins Spaniards Ana Peleaz, Maria Parra and Marta Perez Sanmartin, Norway’s Sandra Nordaas, France’s Agathe Laisne and Denmark’s Puk Lyng Thomson, who all gained automatic spots on the European team by claiming the top-six places on the PING Junior Solheim Cup European Ranking. Germany’s Leonie Harm, Austria’s Emma Spitz, Sweden’s Elin Esborn, Switzerland’s Albane Valenzuela and a second French player, Mathilda Cappeliez, who were selected along with Mehaffey as the Captain’s Picks after the final counting event, the British Girls’ Championship at West Kilbride. “I am delighted with how things have turned out,” said European Captain Iben Tinning, who played on four European Solheim Cup teams and won six Ladies European Tour titles. “I would like to congratulate the European young ladies who made the team and I’m looking forward to watching what I know will be a hard fought PING Junior Solheim Cup event at St. Leon-Rot GC next month. "This is an event we are very proud of and further emphasizes PING’s significant and consistent commitment to Ladies Golf,” said John Solheim, the Chairman and CEO of PING and the founder of the PING Junior Solheim Cup. Ivan Khodabakhsh, CEO of the Ladies European Tour said: “I think the fact we’ve got three Spaniards, two French girls plus players from Austria, Denmark, Germany, Ireland, Norway, Sweden and Switzerland in the team shows how golf is developing all across the Continent. "It’s very encouraging and the geographic mix augers well for the future of women’s golf on this side of the Atlantic." The PING Junior Solheim Cup 2015 is to be played at St. Leon-Rot Golf Club on September 14-15 immediately ahead of The Solheim Cup, which is staged at the same German golf club on September 18-20. It is the first time the same venue has been used for both matches. The PING Junior Solheim Cup is a team matchplay competition between Europe and the United States, each team featuring the best 12 female golfers 18 years of age and younger. The competition consists of 24 matches – six foursome matches, six fourball matches and 12 single matches. The aim of the competition is to give juniors the opportunity to further their golfing careers by playing matchplay at a high level and also for the competitors to meet, learn and be inspired by the professional players playing in The Solheim Cup. The 2015 event marks the eighth time the PING Junior Solheim Cup team will be contested, with the US Team currently leading the series with four wins, two losses and one tie. 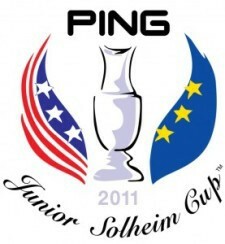 The PING Junior Solheim Cup was established by PING CEO and Chairman, John Solheim, back in 2002 and has since developed a deserved reputation for showcasing the talents of the world’s best female junior players with Azahara Munoz, Anna Nordqvist, Carlota Ciganda, Beatriz Recari, Melissa Reid, Charley Hull, Caroline Masson, Caroline Hedwall, Paula Creamer, Vicky Hurst, Brittany Lang, Brittany Lincicome, Morgan Pressel, Jessica Korda, and Lexi Thompson all playing in the match before graduating to The Solheim Cup.